Join Catherine Schrenker and Tracy Thompson for a fun, easy afternoon learning how to lay out and paint a Barn Quilt of your own! Size of finished boards will be 2′ x 2′ (that’s bigger than you think!) and all materials are provided. Cost of the class is $65.00. We will provide the primed board, the pattern, which is different every workshop… we provide everything else-paint and supplies, we suggest you bring something to drink AND a snack to share, and be ready to paint! Click here for a template pattern to play with and figure out colors: Quilt Template with your own colors. This workshop is ALWAYS FUN!!!! History of the Quilt Trail: Inspired by Appalachia! 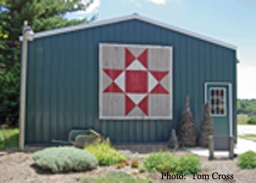 The concept of barn quilts began with Donna Sue Groves and her wish to honor her mother, Maxine, and her Appalachian heritage by having a painted quilt hung on her barn in Adams County, Ohio. As is often the case, good ideas fall by the wayside when work and other obligations intervene. Donna Sue mentioned the project from time to time for several years until she was encouraged by her friends to go ahead and paint that quilt square. Her work with the Ohio Arts Council and other community organizations inspired Donna Sue to alter her plan. Rather than creating a personal tribute, she suggested that a “sampler” of twenty quilt squares could be created along a driving trail that would invite visitors to travel through the countryside. A committee of volunteers worked together to both plan the trail and to formulate guidelines as to how the project would be managed. Several barn owners signed on, and the work began. So it happened that the first quilt square on the American Quilt Trail does not hang at the Groves farm. The Ohio Star was painted by local artists and installed on a building at a greenhouse nearby-a location that allowed for a public celebration of the inauguration of the quilt trail. 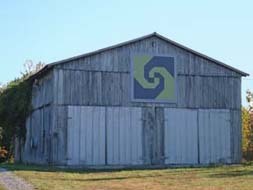 A Snail’s Trail quilt square was later painted by an artist and mounted on the barn where Donna Sue and Maxine Groves reside. That first quilt trail was hardly begun when a group of quilters from neighboring Brown County, Ohio, started their own project. For several years, Donna Sue worked with organizations in Ohio and Tennessee to foster the growth of new trails. She also served as advisor for dozens of individuals who were either creating a painted quilt for their own property or planning a quilt trail in their community. Donna Sue traveled to Iowa to introduce the concept; each year more and more trails are created in that state. Kentucky was the next to join; the Bluegrass State is home to about 800 painted quilts. Quilt trails are created by quilt guilds, civic groups, local arts councils, 4-H clubs, school groups, and other organizations. Most are a countywide effort, which allows for a distinct trail in a single area and creates local pride in the project. This simple idea has spread to 48 states and to Canada, and the trail continues to grow. Over 7000 quilts are part of organized trails; dozens more are scattered through the countryside waiting to be discovered. Most often we believe that barn quilts must be part of the wonderful Amish quilting heritage or that they came to America from some European tradition. Although both of those theories are interesting and have been published from time to time, they just are not based in fact. The origin is set within our own Appalachian heritage. How can I be so certain? The answer is a rather simple one. No one has been able to document the location of a painted quilt square that existed prior to the Ohio Star that was painted in Adams County, Ohio in 2001. Donna Sue Groves’ idea continues to inspire folks across the country to join what has become the largest grassroots public arts movement in our history. When you shop at Amazon, please go to the Amazon Smile site. It looks exactly the same, but a percentage of your purchases goes to us! We are listed under “Appalachian Heritage Schools” so when asked to designate a charity, just type that in and start shopping!